A heap of names are being thrown around in relation to new blood at Ibrox. 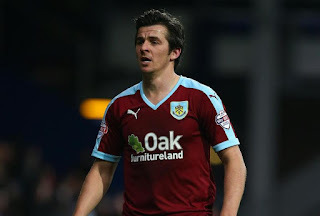 Danny Graham, Greg Stewart, Madjid Bougherra and Grant Hanley (plus many more) have all been linked with a switch to Rangers this coming transfer window, but it was with great curiosity that Burnley midfielder and well-known livewire Joey Barton has joined the ranks of those being touted in. It would be folly to dismiss all these stories as complete nonsense, but the Joey Barton one really does take some believing. Do not forget, inasmuch as his services got him a place in the PFA Championship Player of the Year, the 33 year old is arguably more famous for his colourful personality than anything he has ever contributed on the pitch. "Absolutely not. If we were offered a top European talent but someone who would spoil that dressing room, we won't take them. The players have worked really hard to get the unity right here. This is a good place to come to work. If a player is inappropriate or dilutes the quality of that environment, he won't be welcome." Barton definitely does not qualify as a top talent but he is certainly a decent player – but quite who conjured up the story of Rangers being interested is something of a mystery. Well you obviously have not seen him play this year, kicked from pillar to post and it normally starts in the first minute and ends in injury time. NEVER reacted this year, only Nine booking in a season. One of the best players at Burnley and its been a privilege to watch him play. Congratulations on your promotion and best wishes for next season. I do not honestly think he would give up the chance to play Premership football in England but if he does decide to head North he goes with our best wishes. You obviously have not seen him play this year, he has been kicked from pillar to post in every game starting in the first minute and ending in injury time, he never reacts, he just gets on with playing football and he has been booked only nine tine times No red card cards. That is just what the majority of Burnley fans thought before we signed him. He has been phenomenonal this season, best midfielder in the division. Voted 4th overall in the PFA awards. Work rate, drive and passion. He his targeted every game by the opposition but hasn't once reacted. I don't actually think he would join you unless you offer a bucket load of cash and long term contract. He enjoys playing for Dyce and Burnley, so I just hope we offer the deal he wants. Snap Boughie up right away , great centre back and doubles at right back , Gers man , tonnes of experience and still has a couple of good years in him . Its a no brainer . You people really have no idea. Joey Barton has been a revelation since joining Burnley. A true leader on and off the pitch. We,as Burnley fans thought similar to you when first linked. But he proved himself to all and won't be playing anywhere other than the premier league with Burnley next season. We only need to look across to Edinburgh for a player who will enhance our club on the pitch and bring value for the future- Jason Cummings- Hibs dont get up this season a bid of 500 grand with add-ons should secure him. I have always rated Barton as a player. I think he would be a great player at Ibrox, however I think Barton's problems as a 'bad boy' are all on the pitch rather than in the dressing room. The reason I mention this, is that Barton will be a target on the pitch against teams looking for a reaction. No doubt he will react and we will be down to ten men. He is I believe a team player who is loyal to the dressing room. For the fear of going down to ten men whenever he plays, I think the fear of him being sent off numerous times will ensure we do not sign him. He has always been complimentary about Rangers on his Twitter account. Jao Carlos texeira former Brentford player unhappy and unwanted Liverpool player he knows Warburton and weir plays left centre and right midfield can also play attacking role desperate to rebuild his career. Don't need anymore wingers mate need another striker and 2 cbs. Got waggy, mckay, forrester, we'll probably stick to 4-3-3 we've got too many wingers at that. Why on earth would Barton move from an EPL club to join a Mickey Mouse outfit like Rangers? What a joke! Joey said: “My first seminar paper that I had to read out in class was ‘Is death bad for the person who dies?’, and I was obviously against. I would take boughy if his attitude (and money) is right. Good player with experience who could marshal the defence. Massive step up from kiernan and Wilson and could be the catalyst allowing those 2 to show their abilities. Some unbelievable comments on here. Joey has been staggeringly good this season. A true leader who's instilled a winning belief in all those around him and his disciplinary record this season has been exemplary. He would be head and shoulders one of the best players in the EPL but isn't foolish enough to go and play there. Would be interesting to see him up against scott brown next year. love to see Joey at Ibrox even for a season,he is just what we need in the middle of the park right now and his experience would be invaluable to the young squad the Magic Man is assembling for the assault for 55,still a great player and a born winner whose matured a lot n recent years...get him in Rangers!